At various times over the years, racing legends Donnie Allison and Red Farmer of the original famed Alabama Gang were on top of the world at Talladega Superspeedway with victories and trips to Gatorade Victory Lane. 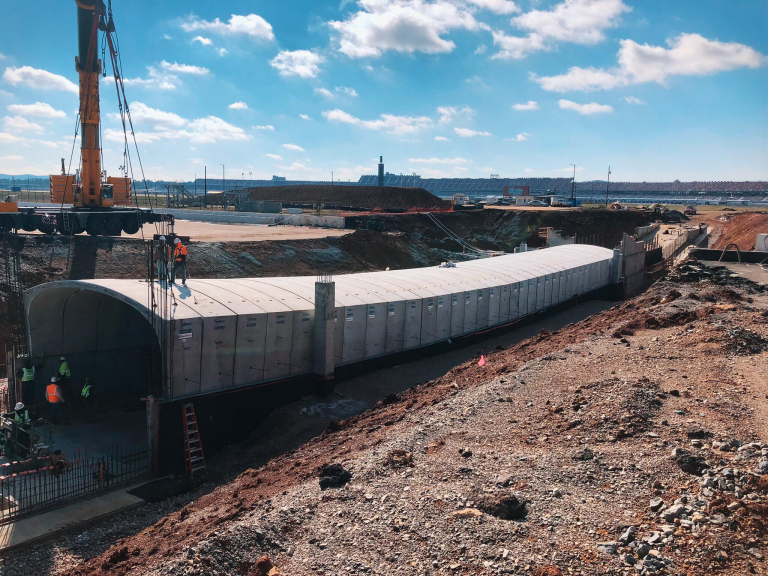 Well, Wednesday, they found themselves on top again, but this time in a boom lift, getting a bird’s eye view of the precast tunnel arches that were put into place as the roofline for the all-new Turn 3 Oversized Vehicle Tunnel, the first development of the 2019 Transformation Infield Project. The iconic duo, who hailed from nearby Hueytown, AL and helped put racing on the map in the Yellowhammer State in the late 1950s, were at the 2.66-mile venue to help kick off the track’s 50th Anniversary celebration. 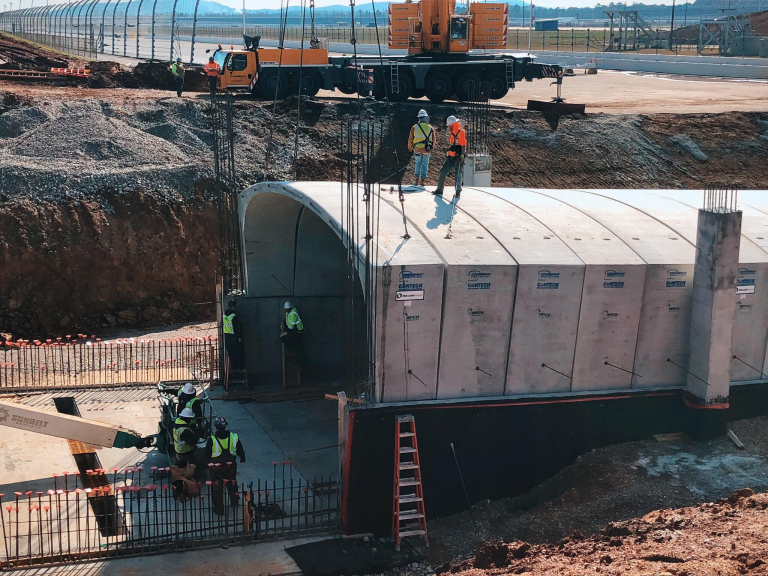 They toured the construction of the tunnel, as well as the new 69-spot Finish Line Premium RV area, both of which are scheduled for completion in time for the track’s April 26-28, 2019 spring motorsports tripleheader weekend featuring the GEICO 500. “I have done a lot of things in my day, but today was a first,” joked 86-year-old Farmer, the two-time Talladega ARCA Series winner (1984, 1988) who will be inducted into the National Motorsports Press Association’s Hall of Fame this coming Sunday night along with six-time Talladega victor Jeff Gordon. “It was cool. I almost felt like I was in my deer stand. I discovered, though, that I am much more apt to be on the ground, so would rather be driving through the tunnel rather than on it. 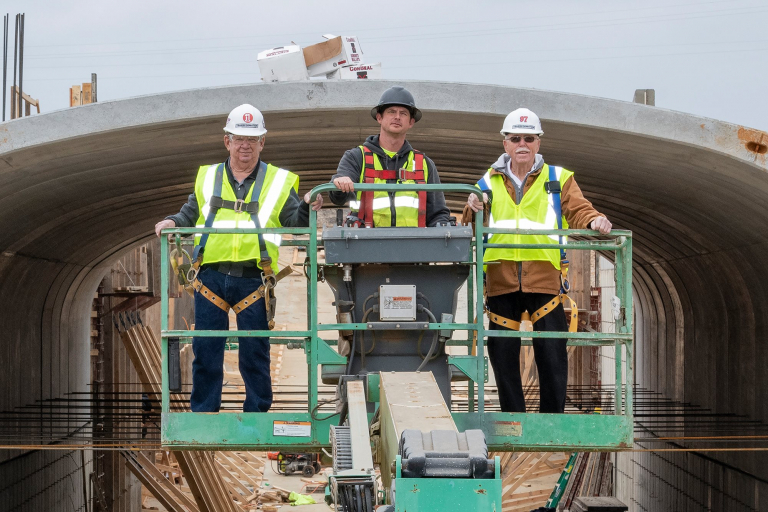 The tunnel is going to be great for the fans and competitors alike this spring,” Farmer continued. 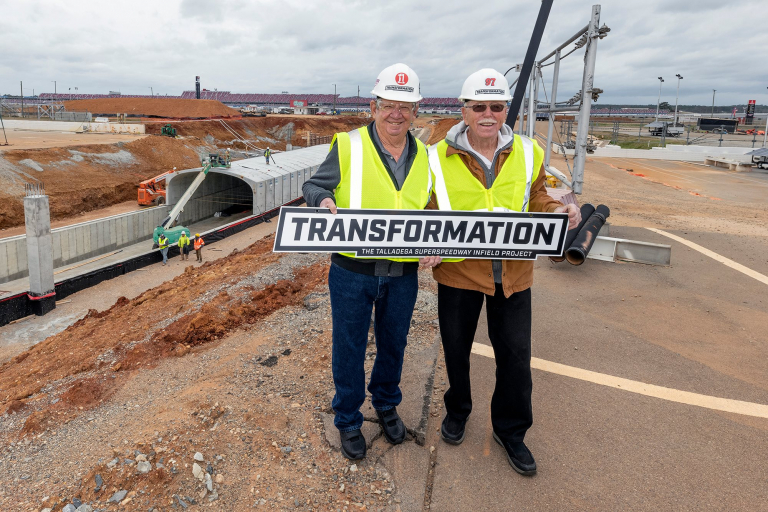 Transformation is the initial part of the approximately $50 million Transformation Infield Project that is part of International Speedway Corporation’s (Talladega’s parent company) long-term capital allocation plan and reinvestment into its major motorsports complexes. 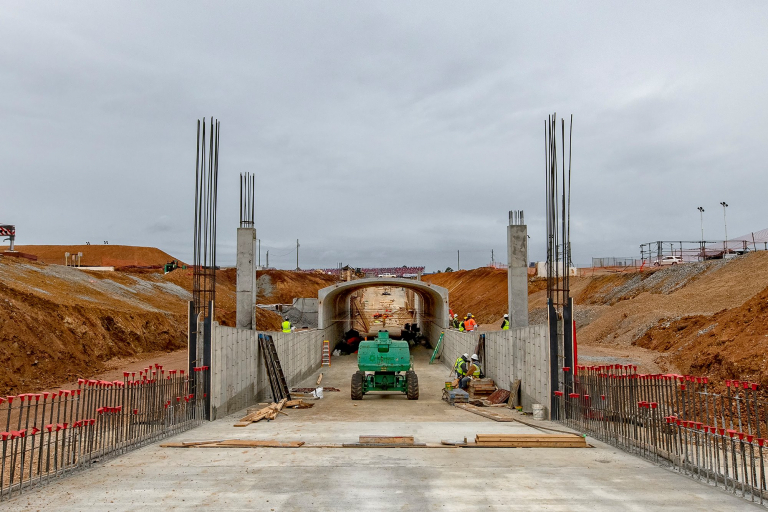 The new 2-lane tunnel will be capable of allowing vehicles as large as race team haulers and fans’ recreational vehicles to enter and exit the track simultaneously with ease. It will be open 24 hours during event weekends. A total of 35 precast concreate arch sections are being placed on the concreate slab and foundation walls. They are approximately 6 feet wide x 28 feet long. Each arrived via 35 tractor trailers and were put into place by a 100-ton crane. Total weight of the 35 arches? An astonishing 731 tons. 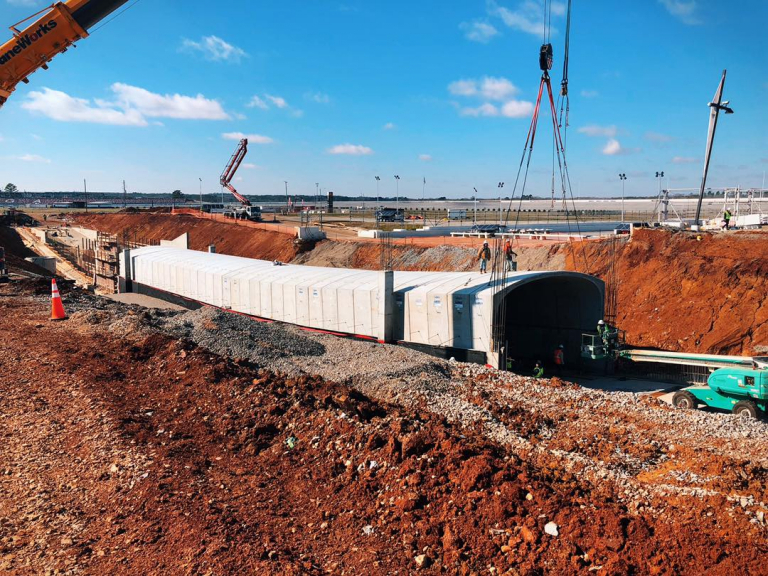 “We’ve had to battle lots of inclement weather, but we’re right on schedule for both the tunnel and Finish Line Premium RV,” said Lance Taylor whose company Taylor Corporation (Oxford, AL) has spearheaded the construction efforts since groundbreaking in late October. Both Farmer and Allison, along with Donnie’s brother Bobby Allison, are the original members of the Alabama Gang and plan to be at Talladega’s spring tripleheader weekend. Farmer is a member of several Halls of Fame, including the International Motorsports Hall of Fame, and is also on the ballot for the NASCAR Hall of Fame, which will enshrine fellow Alabama Gang member Davey Allison on Feb. 1. Farmer is a three-time NASCAR Late Model Sports Champion (1969, 1970, 1971) and was named one of NASCAR’s 50 Greatest Drivers. He has won nearly 800 short track races in his career, and actually still competes at Talladega Short Track (dirt track) in the Late Model division on a regular basis. Donnie captured a total of 10 Monster Energy NASCAR Cup Series triumphs. He, too, is a member of several Halls of Fame, including the International Motorsports Hall of Fame and the National Motorsports Press Association Hall of Fame (inducted just a year ago). February’s Daytona 500 marks the 40th Anniversary of one of NASCAR’s most noted finishes in which Donnie and Cale Yarborough crashed on the final lap. 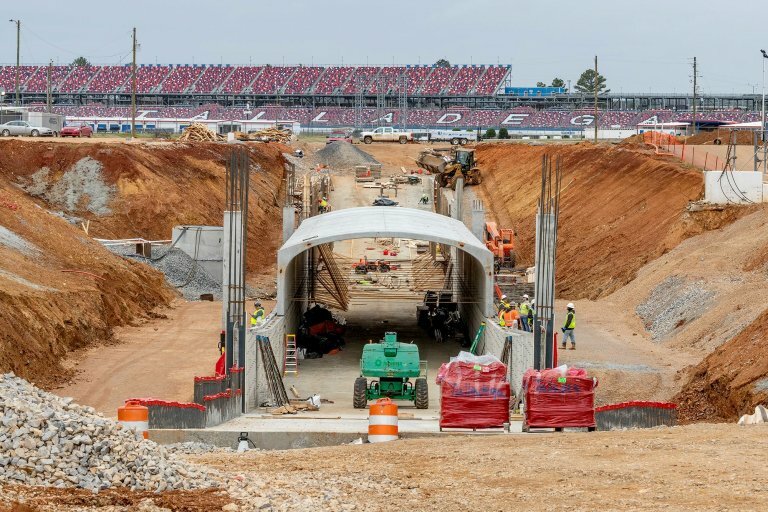 The culmination of Transformation will occur this October and will allow fans to be immersed into the sport of NASCAR with the one-of-a-kind Talladega Garage Experience, which will feature “up-close” access, interactive attractions and enhanced amenities for fans, sponsors, teams and stakeholders in the iconic Talladega infield. For ticket information on the track’s upcoming weekend, featuring the General Tire 200 (Friday, April 26), MoneyLion 300 (Saturday, April 27) or the GEICO 500 (Sunday, April 28), log onto www.talladegasuperspeedway.com or call 855-518-7223 (RACE).